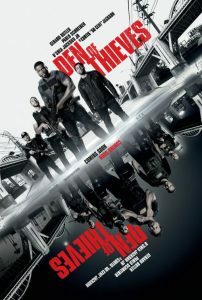 First time director Christian Gudegast who was one of the screenwriters on another Gerard Butler film London has Fallen recasts Butler as the tough talking LA cop in the Californian crime drama Den of Thieves which is heavily influenced by the far superior Michael Mann directed thriller Heat. 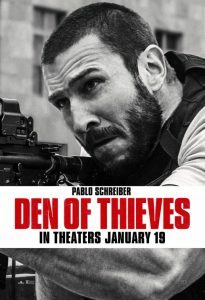 Gerard Butler plays Big Nick O’Brien who heads up an elite team of L. A. detectives who are hell bent on busting a sophisticated crime ring which robs banks headed up by Merriman wonderfully played by Orange is The New Black’s Pablo Shreiber (13 Hours, The Secret Soldiers of Benghazi). 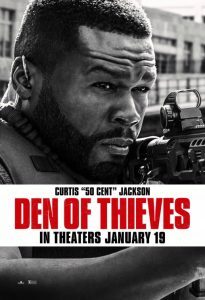 Merriman along with his second in command Enson Levoux played by Curtis 50 cent Jackson (Get Rich or Die Trying) put in place an elaborate plan to rob the Los Angeles branch of the Federal Reserve Bank where they not only print new dollar bills, but also destroy old money, hoping to steal $30 million dollars before it gets incinerated. What follows is a fascinating cat and mouse game between Merriman and O’Brien, which director Gudegast teases out the plot for maximum tension to create a gritty crime film that stretches from the seedier sides of L. A. to Long Beach, where there is no honour among thieves. 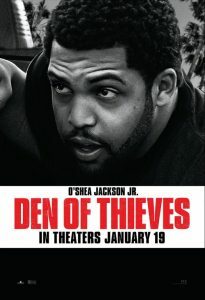 All the while, there comes between the two main protagonists, a nonchalant middleman and occasional barman Donnie Wilson wonderfully played by O’Shea Jackson Jr, (son of rapper Ice Cube), clearly taking inspiration from Kevin Spacey’s Oscar winning turn in Bryan Singer’s The Usual Suspects. 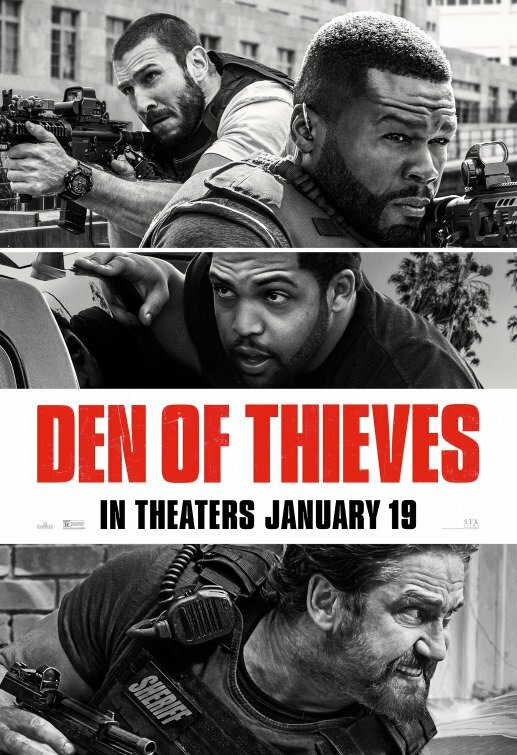 If audiences are looking for a macho action film, then go and see Den of Thieves. There is a sufficient amount of action, plot twists and bromance to keep the action going, particularly the malevolent rivalry between O’Brien and Merriman which propels the crime caper to a tantalizing and violent climax shot in a Los Angeles traffic jam on a sun-drenched Californian underpass. 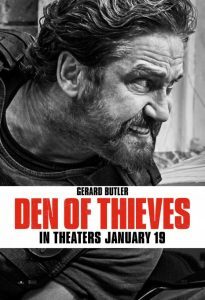 Den of Thieves gets a film rating of 7.5 out of 10 and is worth seeing particularly aimed at male viewers.